Marshall: The most respected name in guitar amplification. When JVM410 heads came out guys said that Marshall was on the wrong road. But were they? I remember when I got my first one. The Marshall JVM410H is an amp that makes many promises and indeed actually does come up with some good stuff (at least where amps are concerned). But things in the world of guitar amplifiers are often not as they seem. Here we have an amp that has some unique features and can be driven harder than a steam roller on the freeway, so does this amp really deliver? For the cost involved it should do. Actually I have bought two of these amps over about three years and it never ceased to amaze me just how much amp you really got for your money. I previously used a Marshall TSL100 and had some great sounds from that amp (checkout metropolis and 'Lightpipe AI' from my 'Eniac' album - wow those tube sounds were awesome for that style of sound. But you know what, I never really recorded much with the JVM410H (either of them). I guess they just didn't have those sounds for me that really make me inspired to write good music in the way that I am acustomed to. The TSL100 was great out of the box and could really hack that tone thing. Well lets get down to the basic review of the JVM410H as both these amps presented themselves to me. Please note that these amps have both been sold, but I remember most of the stuff from the 'top of my head' (where the hair should be) and its defined in this review. Basically this amp has four channels with three 'modes' per channel. It might look scary to use but in fact is a real easy piece of kit to get sounds out of. As you can see this one was not old and not abused in any way. I did buy this one second user but the original buyer had only used the amp a few times over a few months so it was a bargain really. 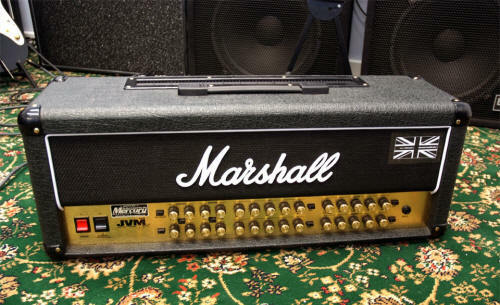 The JVM comes in that now infamous black elephant style vinyl and the cabinet is one of those with the thicker style cab sections that marshall use these days more often than not. Everything else was really thoroughbred Marshall, from the control knobs, through the covering, the white piping, the gold front and rear panel and of course that inimitable giant Marshall logo. The eagle eyed of you will notice the Mercury Magnetics logo on the front; more of that later. By the way, this amp in the UK second user cost me about £600.00 (that's about $950.00 as of writing this review). So these amps are basically good value for money. If you compare this with the AFD100 amp for example, you are getting 10 more channels in effect, far more inside, but this amp costs much less second user and probably always will. But using the AFD in some ways as a comparison is a little unfair to this amp - they are both designed for differing era's of music in my opinion. If I remember this one was about a 2008 manufacture so it was not that old and as you can see its nice condition all round. Well much like the later AFD amp the chassis is made from the same 1.6mm steel as used pretty much universally by Marshall. Its a well put together affair and really it has to be - if you look at the picture and examine the transformers - those things are really heavy. Imagine how much stress and strain is going through that chassis each and every day while you throw this head around - indeed as many guys do for a living. The head cab has plastic corners a la Marshall but unlike the AFD the rear of this is held in place (if I remember correctly) by wood screws. No Choke - It's no Joke Either! That's right, this amp has no choke inside like the older amps. Santiago Alvarez from Marshall did say that because of the style this amp was designed for that it did not need a choke. Maybe that's correct. But as you can see from the above image this one has a choke - that was fitted by me to resolve some issues with this amp which I'll cover later in the review. Well what have we here - a modern tube amp with pcb's as you would expect with a few extra small boards for various features inside the chassis too. The main board (and indeed the whole internals) are exactly what you would expect from a modern tube amp. 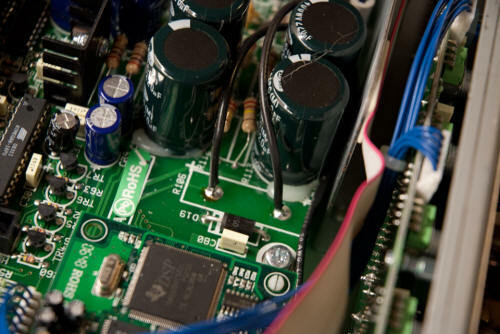 There are the two massive transformers - one at each end of the amp, and on the right of this image you can see the regulation area of the board going on. At the far side is all the ins and outs of the amp, i.e. speakers, loop, control connectors and other stuff and here at the front of the picture are the user controls. This amp uses a great switching system for the floor pedal, which is being carried forward to other newer amplifiers from Marshall and I guess that big fat square chip has something to do with it all but I'm just guessing on that aspect of the amp. In any case, this is a very well put together amp as you can see and it's unlikely that you will have many problems from this amp. Nearest to us is the preamp tubes and furthest away on this picture are the Power Tubes, which in this case are EL34's. There are 5 x ECC83 tubes for the preamp section so drive will probably not be an issue on this amp (it isn't - read on). 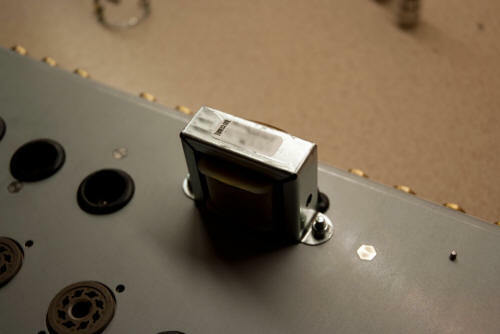 Again we see the tube sockets mounted right on the PCB. Santiago Alvarez of Marshall amplification confirms that this method of build has few problems. Overall the build of this amp is extremely good for a mass produced product. 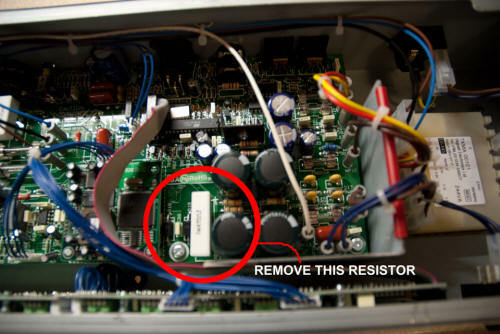 With the JVM410H you have to remove the chassis and get out a meter to check the biasing on this amp. Today many amps have moved on but the good old JVM410H seems to be stuck a little in the past as far as biasing is concerned. Amps like Randall can easily be rebiased from the outside - indeed even the TSL100 Watt could be biased from outside the amp. But this one cannot. 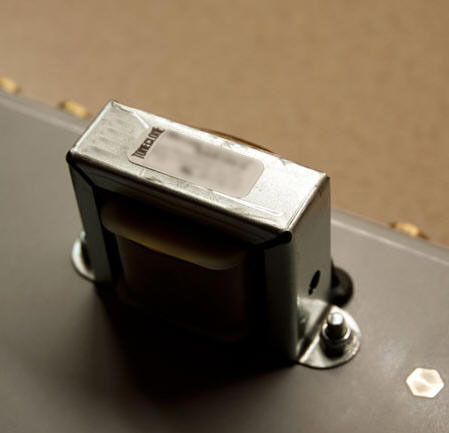 Mesa Boogie 'fix' the bias so you can only use tubes within certain tolerances in their amps - good for them - bad for you. Fit tubes out of tolerance and you will sound sh*t and /or have other problems which follow soon after. Marshall have moved on a little since this amp as the AFD100 now has auto biasing (as does the YJM100) amp from Marshall. Never mind - it was this way for a long time and you only really do it if you change the POWER tubes and preamp tubes don't get biased. red) appearing in the respective MODE switch; the preamplifier’s gain structure is uniquely reconfigured for each and every mode. CLEAN GREEN MODE: This is the cleanest of the three modes and, in keeping with traditional clean amps it uses a simple and straightforward circuit, keeping the signal as pure as possible. In this Mode the channel’s Volume control is taken out of circuit as is the case in vintage amplifiers of this nature. This is the only JVM mode where this happens. CLEAN RED MODE: This mode pushes the original clean sound even more and transforms itself into a pseudo high gain channel with the addition of yet another gain stage after the tone stack. From here on the JVM reverts to the more typical Marshall preamp circuit characteristic of ‘gain then tone’. This is also true of the OD1 and OD2 channels. CRUNCH ORANGE-MODE: This mode is like a Marshall JCM800 2203 amplifier, a staple of hard rock. The gain structure is gain + gain + gain + tone. CRUNCH RED MODE: this shares the topology of the Orange mode but with more gain, giving you sounds similar to a hot-rodded JCM800. - one in each channel. OD1 ORANGE MODE: This adds more gain stage to the ‘OD1 Green’ circuit and results in a sound that’s perfect for singing leads and hard rock/heavy metal tones. OD1-RED-MODE: Adds more gain to the ‘OD1 Orange’ for a high gain Marshall sound. This channel is similar to the OD1 channel but with even more gain (you are not kidding) and a slightly different tone network with the Middle control shifted down to being centred around 500 Hz instead of the more typical Marshall value of 650 Hz. The result is 3 high gain modes that are ideal for both lead and modern rhythm metal tones. End of the Marshall Description. Firstly I used a tried and trusted 1960A cab with Celestions as standard - no not those wimpy green backs but the G12H jobbies that can crack off your head at 30 paces (no wimps here). I'm not going to bore you all with hours of chat about how the sounds compare exactly with Marshall's descriptions. But I AM going to tell you what I had an issue with on this amp. Everything is great until you get to those OD1 and OD2 modes on RED. When you do set those up at any gigging level be prepared for the high pitched feedback. I tend to use an amp with 'more' drive than less drive. My view is that if it is there on the amplifier - then I want it. I'll make no bones about it - I want it ALL. What I don't want is an incessant high pitched feedback that is completely uncontrollable. I found that if you use a regular hum bucking guitar like say an Ibanez, Gibson or similar then your gain on OD1 and OD2 will be set no higher than 9:00 on the drive knob for that channel in the red mode. You see, where I come from, and I see something like that, it always tells me there's something wrong basically. So I went down the road of changing out all the preamp tubes (I bought the best money can buy) and it made no difference. So then I went and bought Power Tubes (just in case) and fitted the best there is, but it all made absolutely no difference whatsoever. Providing you keep those drive pots at 9:00 or lower it will be good for you and above that? Well it's unlikely you would/could do that and actually play at gigging volumes. Bedroom maybe - gig - no chance. You can check further down the review what I did to solve this one. When you check this amp you will see TWO effects loops (good) one series (good) and the other series/parallel (not so good). I had no issues with these loops except that the series/parallel one was not kind to things going through it in the parallel mode. So I stayed with series mode. Check out some of my other reviews of Marshall amps on this site for a complete rundown of the difference between series and parallel loops for a better description - I just don't want to rewrite it all again. Suffice to say these two loops were quite adequate and are switchable - but I would not recommend the parallel loop - it sounded funny - and was funny - I laughed and laughed until I could stand no more then turned it off. There's some good news on this amp - it has a MIDI in and a MIDI through on the back, which means you can control the amp (as well as the supplied awesome footswitch) with other pedals if you need to, such as the Switchblade or the Ground Control - both recognized world leading amp controllers and routers. The midi was working within five minutes of plugging in the ground control as a test so you can do it all too. Maybe control the amp with a GT-10 or something like that. For the HD500 boys you could control the amp with that - and disable those crap sounds once and for all :-) (well at least I think it's funny). Or indeed put the HD500 through that bad parallel loop and improve the sounds; or stop it Tony, you might annoy someone. In any case its a really great bonus to have these onboard. Here you can see all of the inputs and outputs of this amp and there are many, with options for a number of speaker configurations as Marshall have done for a while now, those important Loops, the direct out for recording, those midi ins and outs and of course the white jack socket for the customised floor pedal. I could talk about this amp all day and how well it's made with the features and benefits of that there are many (a major one being the control pedal supplied with this amp; its a real corker and the JVM410 was the first amp to be introduced that includes this.) But for me, this amp had one flaw - it would NOT drive past about 9:00 on OD1 and OD2 RED channels. And for some time it really bugged me. 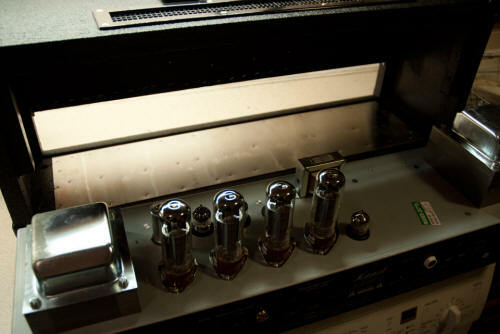 It's not those great bottom end clunks that this amp can do, or the sparkling cleans that it's also great at. It's not even the plexi style sounds or the newer sounds in there - it's just those pesky OD1 and 2 channels when on RED - indeed they made me see red too! That's why I sold the first one of these that I bought. For my style of rock - really driven usually and sometimes detuned on those two channels it was not a pretty picture. So in any case, why did I buy another? I must have been mad? Well not really. You see, I sometimes carry out mods of my own (or stolen from others) or make amps or - well I can (be sure you can if ever you try them out or you may go outside and be there for some time as they say). Without any modifications I rate this amp at about 6.5 to 7 out of 10 primarily because of the screaming at me and not in agood way. Now that's not a reflection on the amp - it's relating to what I get from the amp. The features of this JVM410H are awesome especially for the price. And if you buy one second hand they are a real bargain. Especially if you don't drive them as much as I do. Check out these amps on eBay and you will find them for sale (usually in perfect condition) for as low as £450-500.00 ($800-850.00) and that is a fantastic price. You see, these amps don't really hold their price in the same way that an (for example) AFD100 or maybe a 50w head might on there. It's a pity for the seller - but you get in there and buy one! Maybe we can. But that is a subjective thing - sound to one guy is different to another - all the time you can see guys either buying or selling amps that are basically perfect - but for one reason or another they don't like or can't appear to get 'their' sound or the sound of their favorite guitarist. What did I do? I fitted a 'choke' in to the circuit board and replaced a resistor. I fitted this choke to the JVM410H because I had read on the internet that it changed the tone of the amp somewhat - maybe it did, maybe it did not but I was determined to find out. Now recently I had a few words from Santiago Alvarez of Marshall Amplification and his basic run down on this was that the amp was fine with the 'resistor' fitted to the amp (which replaces the choke on the JVM410H) because the amp was designed to work with a resistor for the sounds that this amp produced. I'll go along with that because if Santiago Alvarez does not know - then no one does! But this mod was caried out some time ago and that information from Santiago Alvarez had not been provided to me so I bit the bullet and fitted one. Now did this modification make ANY difference? That is the ten thousand dollar question. But really, the choke cost about $30 something and I had some spare time, so what did I have to lose. You will lose your life if you don't know what you are doing.. so don't do this if you don't have a clue. For me it was a couple of hours work and I had a modded amp. But did it sound better? Yes and no. Actually I did notice a slight change to the amp tone. 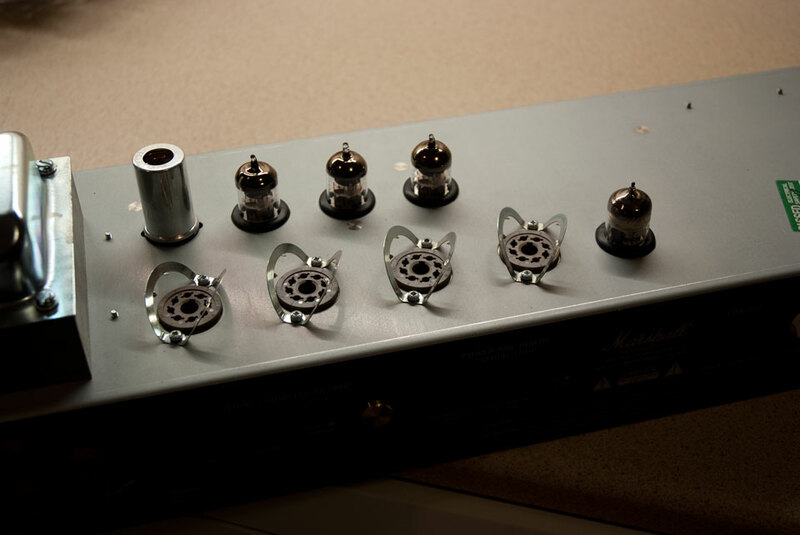 I also fitted a 10 henries choke because I can (MM recommend 3 henries) and you know what, I could get those preamp drive knobs to 11:00 - well it's not up to 11 like some guys we all know, but it was an improvement on the channels as far as I was concerned. Maybe that 10h was the secret - I used that one because I had one lying around (as you do)... seemed like a good idea at the time - and would be easy to convert back if I did not like the change. I cannot guarantee you will have the exact same results, it could have been wiring routing or a thousand other things but it did work for me (partly). Maybe it was because I used a 10h instead of what everyone was telling me? or maybe I was just lucky? who knows. I guess Santiago Alvarez knows (he is good that way) but one thing is for sure - it did make a difference for me. Unfortunately it was not enough difference because I sold it. I never really did get this JVM410H the way I really wanted the amp to sound. Even from Marshall (the first one I bought) it did not quite sound how I wanted it to. I really had some time for this amp - it promises everything (or it did at that time) you want in a Marshall amp. But sadly, as the thrill of this one wore off I sold it. I even tried twice - I was that convinced! In any case this will be an awesome amp for many players. If that drive knob had just made 1:00 I would have been a happy player. What about sound samples and videos? When I had this amp I did take some video of a before and after of the choke mods and how it affected the amp sounds. It's here somewhere so I'll do some digging around and post it on here if I find it. As far as the usual video reviews I do of amps I can't do that for the JVM410H because I sold it to use the money for the AFD100 head I recently bought (at least that's my story). Would I buy another JVM410H; of that I can't really say. I did buy two of them (not at the same time) so I did enjoy this amp for some time, it's just that overall I did not get on with it as say for example the TSL100 amp; that was a great sounding amp. I also like (if you didn't know already) the AFD100 which sounds awesome in its own way. That YJM100 also looks good from here we shall see in a forthcoming review in the future. The JVM410H is a really great amp that is useful for most styles of music - and I emphasise most styles here - it's absolutely NOT a one trick pony, but if you HATE knobs that you can't turn past 9:00 by what seems like design features on your OD channels then maybe you should pass on this one. REMEMBER - I really do crank those drive knobs - the AFD is near enough 10:10 when I play that amp. Actually if you hate knobs - don't buy this either - there are a few to play with on the front panel - I'm kidding - this amp is easy to use and setup. You bought one, great; noise in the background 'squeal, squeak, swoosh' what was that you said? I didn't quite catch that, you're feeding back too much. This review for Dave Rivers - hope you like it!